13th Age in Glorantha is being offered in two books, a 13th Age Glorantha Rulebook and a Glorantha Source Book. What are these books about? How does 13th Age in Glorantha support the special demands of the colorful and often heroic setting? Jeff Richard: The 13th Age in Glorantha rule book takes the existing 13th Age core rules and adapts them for play in the setting of Glorantha. Written by Rob Heinsoo, Jonathan Tweet, ASH LAW, and myself, it introduces new playable species, new classes and class variants, revises the icon relationships for the Gloranthan gods and runes, stats up many Gloranthan monsters, presents a starter adventure (in the classic Snakepipe Hollow region), and much more. The Glorantha Source Book is intended to be a basic source book on the Glorantha setting. By Jeff Richard, this will be another hardbound, full-color book approximately 128 to 150 pages long and provides information useful for both those new to Glorantha and to the most hard-core Glorantha-phile. The Glorantha Source Book is more myth-centric than the Guide to Glorantha. It introduces the core gods of Glorantha and place them within the elemental mythic cycles of Darkness, Water, Earth, Fire, Air, Moon, and … Chaos. The Source Book describes the region of Dragon Pass and its surrounding lands (Holy Country, Lunar Provinces, and Prax), set during the later Hero Wars (circa 1627). Sartar is now free, Argrath has relit the Flame of Sartar, and the feud between the White Bear and Red Moon rampages across Dragon Pass. This is a time of rapid change and transformation, of high adventure, and of mythic quests that threaten to change or even destroy the world. It is a time perfect for 13th Age gaming! Jonathan Tweet: Thanks to the books’ emphasis on myths, it’s easy for a Glorantha-savvy GM to run a campaign in other times and places. The 13th Age rules are light, so it’s easy to port creatures, magic, and characters from Glorantha sources into 13th Age rules. 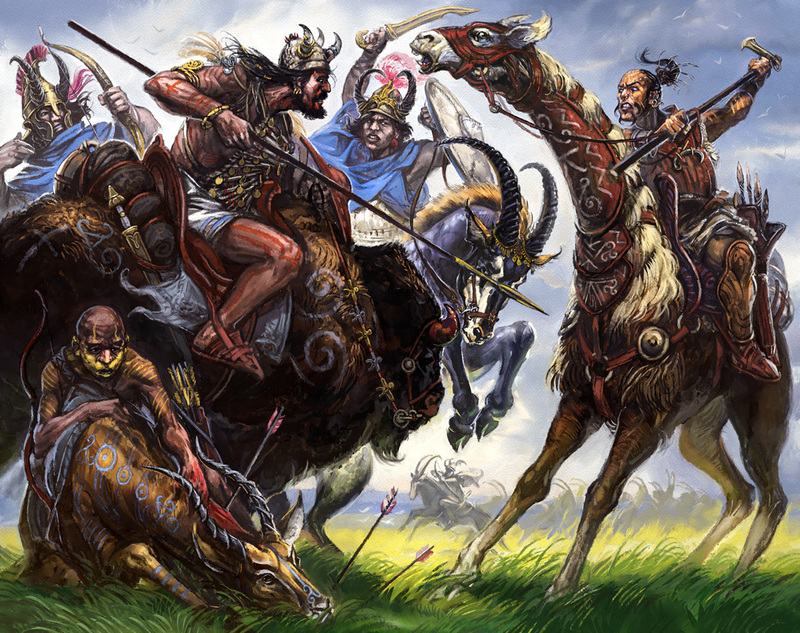 I love the classic Sartar-Lunar conflict and have a soft spot for the Lunars, but the beauty of Glorantha is that there’s so much going on across the world and down through history. 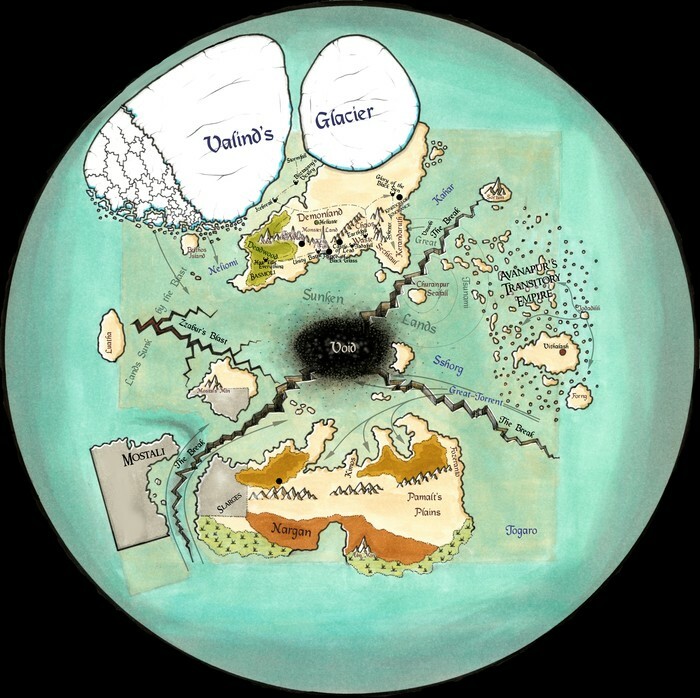 Glorantha is a unique no-EDO (Elves, Dwarves, Orks) fantasy background. Personally, I know Glorantha since the early 80s, but I never really got into it. The video game and especially the mobile version of King of Dragon Pass helped me a lot to better understand the world and its very deep mythology. Where do you think should an interested Glorantha novice start? Jeff Richard: The Glorantha Source Book we are producing through the Kickstarter is intended to be the starting point for any interested Glorantha novice. Until that comes out, the best places for an interested Glorantha novice to start out relatively inexpensively is either through the King of Dragon Pass game for iOS or Android systems, or with the forthcoming HeroQuest Glorantha book (which is the HeroQuest 2 rules book for Glorantha and should be available shortly after the 13th Age Kickstarter is over) or the forthcoming Annotated King of Sartar book (which will be out by the end of the year). There is also a free webcomic, Prince of Sartar. The Guide to Glorantha is the BEST source on Glorantha, but at over 800 pages, it is pretty big commitment for an „interested novice“. Rob Heinsoo: I’ll second Jeff’s recommendation of the King of Dragon Pass game. You play as a clan of cow-herding Bronze Age warriors moving into a land that has been free of humans since the dragons killed them all a few centuries earlier. It’s a great game to play so long as you read the manual and care about keeping your crops healthy as well as going on heroquests and raiding your enemies! The background myths available to anyone playing the game make a great introduction to Glorantha. As you keep playing you’ll find that they aren’t really background: they’re the stories that are going to keep your people alive. And that’s going to be even more true in 13th Age in Glorantha, where the people in question will be your player characters! How did you discover Glorantha and why is 13th Age in Glorantha your dream project? Jeff Richard: As a kid, I grew up on a diet of Bullfinch’s Mythology, Robert E. Howard, and Michael Moorcock. Like pretty much everyone, I came to gaming through D&D (1st Ed. AD&D in my case), but then I discovered Glorantha over 30 years ago, through a board game called Dragon Pass (previously White Bear and Red Moon) and through the game system RuneQuest 2. I found that Glorantha felt so much more „real“ than other fantasy settings – precisely because in Glorantha, magic and mythology was the bedrock foundation for the setting. 13th Age in Glorantha combines the familiarity of the D20 rules systems, with the creative flexibility of HeroQuest 2. The One Unique Thing allows players to tailor their Glorantha and their game to what they really want to play. The flexible background rules enable the creation of unique and fun player-characters. The icon relationship system is easily adapted to Glorantha’s gods and runes. In short, 13th Age was tailor-made to bring Glorantha to the wider gaming audience. Rob Heinsoo: I’d gone from the earliest edition of D&D to playing a lot of the micro-wargame O.G.R.E. from the American Steve Jackson. The company publishing his games in those days was Metagaming. They had a house organ magazine named The Space Gamer. It ran a short article by Niall Shapiro about the resonance of myth in a wargame called White Bear and Red Moon. Myths playing out in a wargame? This sounded incredibly cool to my 12 year-old self. I started reading the books on mythology and anthropology that the article and the game recommended. That changed my life. As a 14-year old, I was incredibly excited when I saw an ad for RQ in Dragon magazine, I knew this was from the world of WB&RM. I saved my money and bought RQ the day it came out. A few decades later I’ve learned how to design games, designed 13th Age with my best friend Jonathan, and now we get to tune 13th Age for our favorite game world, Glorantha. Along the way we’ll tune aspects of Glorantha towards the system we built together. My 14-year old self didn’t dream it could be this much fun. Jonathan Tweet: I bought RuneQuest on the strength of a review, and that’s where I learned about Glorantha. As a gamemaster, I had stubbornly refused to buy modules or support material for my RPGs, instead inventing all my own worlds and adventures. But damned if the Pavis campaign setting didn’t finally break me, I bought it, and of course, I needed to buy Cults of Prax as well. This project is my dream game design project because I get to give back to the game world that gave so much to me. What’s your favorite or what do you think is the most important feature of the Glorantha setting? Jeff Richard: Glorantha’s main theme is religion and the magical relation of man to god. In Glorantha, the gods and goddesses are real, and play an active and important part in most major events through their followers and cults. The Sun, the Earth, the Air, the Water, the Darkness, and the Moon all have powerful deities associated with them, as do powers such as Death, Life, Change, Stasis, Illusion, Truth, Disorder, and Harmony. There are lesser deities to things as diverse as cats, cows, boats, vengeance, and volcanoes. The mythology of Glorantha is the key to the setting. Mythology explains both the cosmos and the mortal condition. Gloranthan mythology speaks to us, with its devolution from a perfect Golden Age to the turmoil of the Gods War, its conflict between Orlanth and Yelm, and the remarkable Lightbringers Quest which saved the cosmos and created Time. It is this mythology that makes the setting distinctive from all others. Rob Heinsoo: I agree with Jeff. So I’ll take the focus on myth one step further. Gloranthan mythology is good for gaming and it’s good for thinking and it helped teach me about our world. Each of the separate Gloranthan pantheons has a rich tapestry of myth portraying that pantheon as the center of the cosmos, or at least as a force for good. You start getting into Glorantha and you learn the Storm pantheon’s mythology, Orlanth’s story, and it makes perfect sense. Then you learn another pantheon’s perspective, the troll’s myths, or even the Lunar myths, and the new perspective also makes sense. Aside from Chaos, which is the enemy of everything, everyone considers themselves to be the cosmos’ defenders, the good guys. And who is right? They’re kind of all right, even though they mostly hate each other and consider each other enemies. Glorantha’s image of a multi-perspective and semi-malleable Godtime matters. And it makes for incredibly rich gaming. Jonathan Tweet: I’d like to piggyback on Jeff and Rob here to say that it’s not just the mythology in the abstract that’s great but the religions that connect individual mortals to great cosmic struggles. In connection with Glorantha you are talking about myth-crawling instead of dungeon-crawling. What does this mean and what is a typical adventure, campaign about? What are distinctive conflicts or threats that the players will have to handle? Jeff Richard: Dungeon-crawling might be best thought of as a type of myth-crawling, shorn of its symbolic and magical power. In a typical dungeon-crawl, the elements are myth-crawling are mostly present: we cross into the Otherworld , we overcomes its guardians and secrets, and return with the boons of the Otherworld. In a Dungeon-crawl, these things are mundane – the Otherworld is just a dark dungeon, the guardians and secrets are monsters and traps, and the boon is gold pieces and maybe some magic items. In a Myth-crawl, we don’t just go to a dark dungeon – we go to the Underworld, or the Sky Dome, or deep beneath the Sea, or some other divine location where the gods original acted. We overcome guardians and other obstacles through combat, negotiation, secret lore, magic, or other means. If successful, we bring back a boon – some of that divine power that made or nearly destroyed the cosmos. Our actions can even change the mythology of Glorantha, and maybe even the setting itself. Jonathan Tweet: What I love about myth-crawling is that it’s a great big excuse to make the adventure more fun. Because the adventure site is the Otherworld rather than mundane ruins, the GM is free to invent and include all sorts of surprising, emotionally engaging, or just plain nasty encounters. Rob already took us partway down that path in 13th Age with living dungeons. Like the world of myths, living dungeons also operate by their own logic. No one worries about the plumbing, air supply, or other pedestrian details. The myth-crawling action in Glorantha takes these living dungeons one step further. Myth logic is about relationships, emotions, identity, and fate. That’s great material for a roleplaying encounter. Rob Heinsoo: The standard dynamic of most campaigns is going to be a mix of mythcrawling/heroquesting and adventures in the world that’s still ruled by time. Sometimes you’ll need to travel to a particular location and heroquest to gain powers that will help you defeat horrible foes who can’t otherwise easily be destroyed in the world under Time. Other times you’ll be tracking down items or knowledge that will enable you to succeed with a particular heroquest that has previously kicked your butts. The most fun adventuring groups will have a mix of characters from different pantheons, worshipping different gods, and the mechanics of how Chaos is breaking the world down will help create story reasons and mechanical advantages for these partnerships between allies who might not be able to cooperate if they weren’t saving the world together. What can Kickstarter project supporters expect to see as far as unique races, classes, feats, etc.? Jonathan Tweet: Rob did the races and classes in 13th Age, and he’s going to do them for 13th Age in Glorantha, too. He’s making sure that each new element will work in a standard 13th Age game as well as in a Glorantha campaign. Rob Heinsoo: We’re going to have humans from the different elemental pantheons, Air humans (Orlanthi, of course) and Earth humans (Esrolians, some Ernaldans), even Darkness humans (Kitori!). The Kickstarter backers have gifted us with the full troll experience, Uz will be a fully playable race, trollkin maybe half-playable! As I type, we’re really close to experiencing ducks as player characters also. We’ll have to see about other races. So far as new classes go, there’s going to be an Ernaldan earth priestess class that functions as a leader and as the center of adventuring groups that might otherwise have trouble getting along. We’re experimenting with a couple different approaches to the Wind Lord class or class variant. Humakt will have a mighty warrior. And the berserker is a more involved barbarian who might worship Babeester Gor, Storm Bull, or Zorak Zoran. There are several other Gloranthan gods we’ll be supporting with specific powers and class advice. There are also a couple like Eurmal that I don’t expect us to handle in this book. I want to give a Trickster character the best treatment possible and for this book I think we’re going to be playing it straight. If everything works out and we can do more books later, we’ll handle Eurmal with the attention he deserves. Most of the 13th Age in Glorantha developers have a lot of experience developing settings and worlds, especially for Dungeons & Dragons. How did Glorantha influence these previous experiences? How does working on these major game lines influence your current work? Jonathan Tweet: Glorantha was the first game world that I ever GMed, other than my own inventions. I have loved following the world as it has been revealed to us bit by bit over the decades. Glorantha taught me how to see the game world from the perspective of its inhabitants, in fact, from the multiple conflicting perspectives of its inhabitants. Each cult offers a complete, coherent view of the world, but those view conflict with each other more often than that they agree. The result is a world that feels dynamic and that invites you to imagine what it’s really like to live there and to care about that world. That lesson forever changed the way I design game worlds. In addition, the gods of the setting link characters concretely to the game world. Religions provide characters with social connections, secret magic, philosophical outlooks, and mortal enemies. The icons of 13th Age were my attempt to do for d20-gaming what religions did for RuneQuest. The icons, too, connect each character to the game world. Years ago, I used the Gloranthan formula when I invented wizard houses in Ars Magica, an RPG about wizards in the Middle Ages. In this setting, too, battle lines were drawn according to metaphysical alignment, with wizards, the Church, Hell, and fairies all in philosophical conflict. Rob Heinsoo: There have been touches I learned from Glorantha in all the rpgs I’ve worked on and designed! In D&D, you might find that most clearly in three books I led or wrote that appeared during the 4e publishing phase, books I don’t expect many Glorantha fans to know, so since you asked, I’ll name them: Primal Power (nature myths! ), Underdark (an over-the-top mythic creation of a bizarre underworld by a crawling god), and The Plane Above: Secrets of the Astral Sea (a new understanding of broken-heavens and how a deeply flawed afterlife leads to bizarre adventures). As to how that earlier work affects current work, well, it’s no accident that Jonathan and I team up as well as we do now after both having led design of a separate edition of D&D. What kind of further development can we expect for 13th Age in Glorantha after the Kickstarter? Jonathan Tweet: I’m really looking forward to watching the Glorantha fans using the 13th Age rules and 13th Age fans discovering Glorantha. 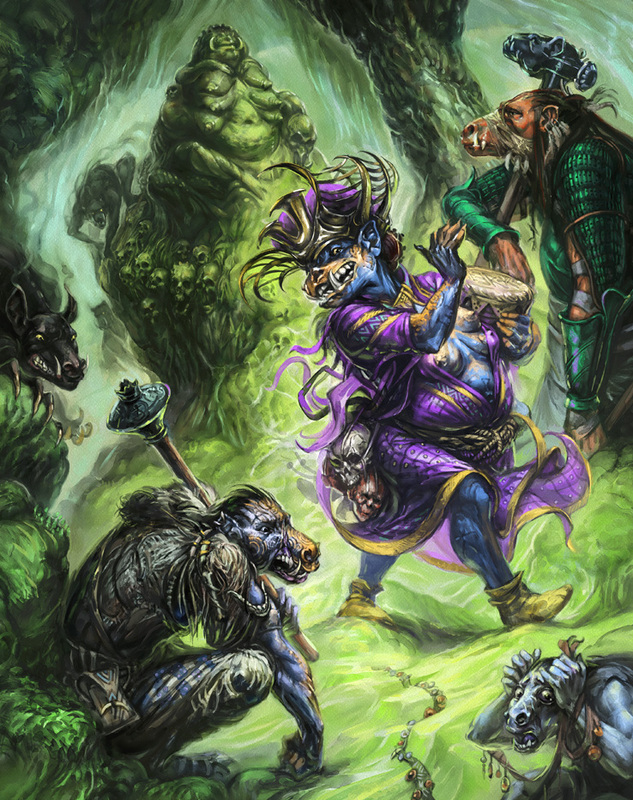 The 13th Age rules offer a new way to treat classic creatures and magic, and I’m sure that Glorantha fans will want to expand what we do to all sorts of different times and places. I’m especially interested in how they’ll handle the God Learners. For 13th Age fans, Glorantha offers a whole new world to explore and exploit. In fact, it wouldn’t be too far to say that Glorantha is effectively multiple, overlapping worlds. Rob Heinsoo: We would love to see this project turn into a line of its own. Glorantha is too rich for a single rulebook to cover even half of its strongest game-worthy themes and races and classes, even when we’re piggybacking on the already published 13th Age rules. So there are still going to be things we’re dying to design no matter how well this Kickstarter does. And I *know* that we’ll want to put out at least a couple of adventures. The success of the Kickstarter suggests this path is growing more open . . . Finally, thank you for your time. Anything else you want to share with the fans? Jeff Richard: Thank you all very much for your support! Farewell on your hero’s journey. I hope we could arouse your interest in Glorantha 13th Age in Glorantha. Wade Rockett, thank you for your help (again).